Placemarker - программа, предназначенная для генерации изображения на основе текста, маркера и дополнительных элементов стиля (фона, цвета, рамки, эффекта текста). После генерации изображения его можно использовать в Google Earth непосредственно из программы. 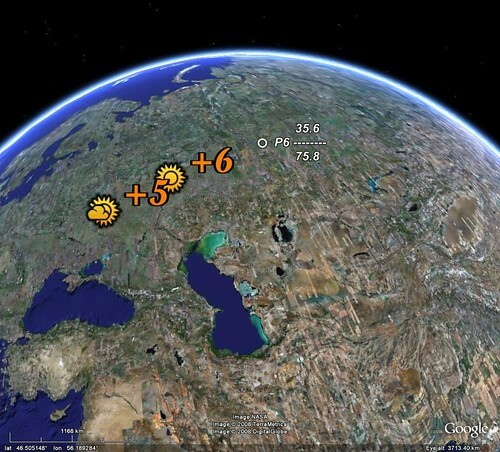 Это существенно расширяет возможности Google Earth при создании требуемых условных обозначений или просто дизайне меток, размещаемых на карте. Placemarker is a stand-alone application for pictures and icons generation in Google Earth (FREE). 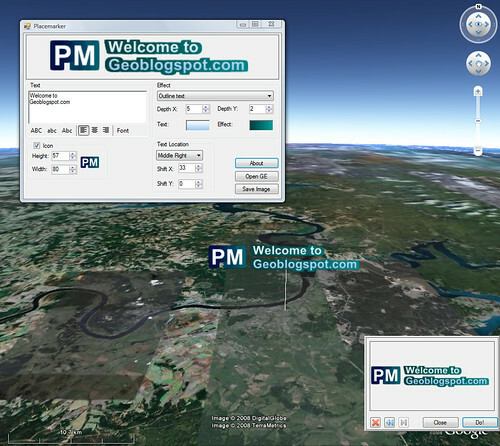 Placemarker lets you create a Google Earth placemark different than the standard placemarks available in the program. Enter the desired text into the box; controls let you set the font, shadow or outline effects (with variable depth), and the location of the text relative to an optional icon. The default icon is shown above, but you can use JPG, PNG, TIF, BMP and TIF files of your own, and re-size the icon to your desired dimensions. “Save Image” saves the text and marker imagery at top as a graphic file. But if you want to place the text/marker in Google Earth, click on the Open GE button. If Google Earth isn’t already open, it will be, a marker will appear at the center of the screen (at upper left in the above picture), and the action box at the lower right. Move the image in Google Earth until the on-screen marker is positioned where you want the placemark to be located, and then click “Do!”. A PNG of the placemark image will be created, and positioned centered at the on-screen marker. The overlay stays at a 0-degree orientation, and covers the same screen area, regardless of how you tilt the display and zoom in/out.